Exosomes are small (50-120nm) endosome derived extracellular microvesicles (EMV). They can contain a vast array of different proteins depending on their host cell which, and their components are further modulated by cellular state (e.g. stress or activation, or inhibition of specific signaling pathways). Exosome biogenesis (A) and protein exosome markers (B). Exosomes were first observed in the early 1980s in the culture media of reticulocytes. They are produced in inward budding multivesicular bodies (MVBs). The resulting intra-luminal vesicles (ILV) are then released through exocytosis into the extracellular space. Based on early observations of this phenomena, the term “exosomes” was coined for such vesicles. Exosomes share similar topology to the plasma membrane and are released by virtually all cell types and have been confirmed in all bodily fluids (see Fig. A). Note: Get the exosome marker poster as PDF. Download a PDF copy. Exosomes can contain a vast array of different proteins depending on their host cell which, and their components are further modulated by cellular state (e.g. stress or activation, or inhibition of specific signaling pathways). Tetraspanins like CD9, CD63 and CD81 are the most common canonical exosome marker proteins, present on the vesicle surface. Surface localization of tetraspanin antigens makes them good candidate targets for immunolabeling and purification of exosomes from biological samples. Components of the endosomal sorting complex required for transport (ESCRT) like TSG101 and Alix, cytoskeletal proteins, integrins and annexins are also enriched on exosomes; these molecules play a pivotal role in exosome targeting and cell adhesion (see Fig. B). 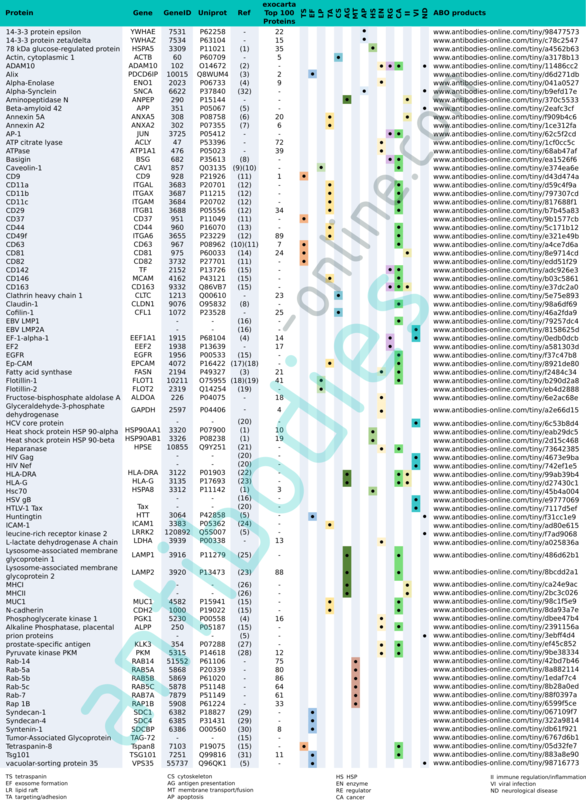 The exosome secretome is vast and diverse, containing many different markers (see http://www.exocarta.org/). However, the presence of canonical surface markers like those listed abovepermit purification and in-depth study of exosome secretion and content from different sample types. antibodies-online offers a range of kits manufactured by BioVision for exosome purification and quantification from human biological fluids (plasma, serum, urine, saliva) or cell-culture media. We also offer kits intended for extraction and purification of RNA and DNA from exosomes. In addition to pre-generated assay kits, antibodies-online also offers a comprehensive selection of antibodies directed against known exosome proteins (see table). 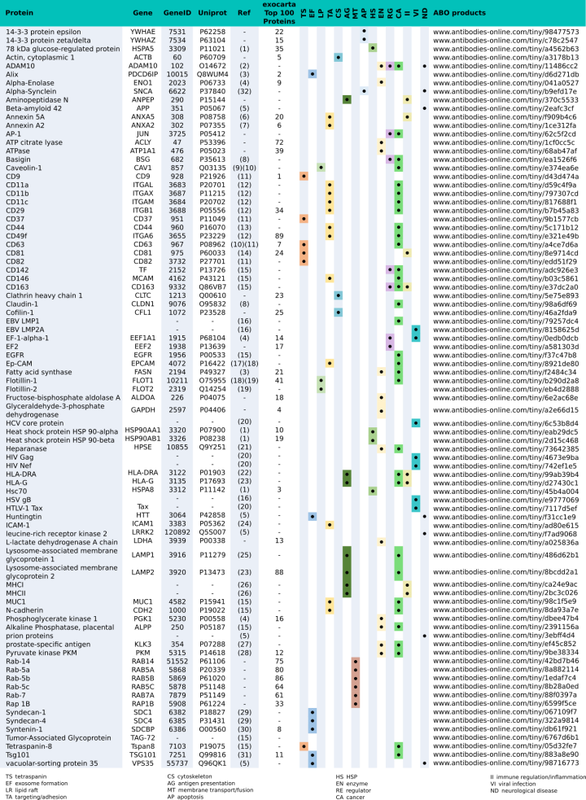 Function of protein exosome markers and their involvement in various pathologies. Secretion of exosomes occurs constitutively though the rate of exosome secretion, and composition of exosomes may be augmented by a variety of intrinsic or extrinsic factors (e.g. cell stress, signaling cascades). Despite their ubiquitous nature, exosomes are considered unconventional secretory pathway components. Because exomes are secreted from nearly every cell type, their composition mirrors their host diversity, and depends heavily upon the type of cell from which they originate. Since the molecular composition of exosomes is reflective of physiological or pathophysiological changes in their cell or tissue of origin, studying exosome composition offers a significant potential to develop new biomarkers for disease diagnosis (see Table). Exosomes are also a widely-implicated in cell-cell communication. Exosome components may be transferred directly to neighboring cells, or may be shuttled across a number of different cells before reaching their end destination via a method known as transcytosis. Exosomes can, therefore, be used to transmit signals across large distances where simple diffusion may be insufficient. Their role in cell-cell communication suggests that exosomes may have a deeper role in many physiological processes; this hypothesis is supported by the observation that exosome signaling plays a direct role in development & patterning, immune response, neuronal communication, and tissue repair. Because of their small size (nano-scale) and simple structure, exosomes may sometimes cross the blood-brain barrier. Various futurists have suggested that exosome delivery systems may offer an innovative new technology to target the central nervous system and treating various cerebral/neuropathic diseases without necessitating invasive surgery. The use of exosomes to transfer genetic information, or to deliver therapeutic agents is a currently underexplored field that holds vast medicinal potential. In some pathologies, exosomes also act as vectors; tumor cell-derived exosomes play an active role in tumor angiogenesis and metastasis. Exosomes shed from stimulated blood cells and the vascular endothelium are involved in neurological disorders such as multiple sclerosis, transient ischemic attacks, and antiphospholipid syndrome. Exosomes may also carry damaged cellular material targeted for destruction, in doing so they may facilitate the spreading of toxic forms of aggregated proteins such as α-synuclein, β-amyloid, and prion proteins and contribute to the progression of neurodegenerative diseases. Some research also suggests that exosome transport has been exploited by viral pathogens to travel between host cells and evade immune detection.